Strange things have been going on with Dan Sartain records over the years. After several borderlain perfect albums, he started shaking things up. While he was a crooning southern greaser with an acoustic guitar and a penchant for cobras for quite a few records; his last album, Too Tough To Live took things in an altogether different direction. On that album his love for The Ramones and other older, darker shades of punk rock came into the forefront. While it was a fantastic record, it did leave me wanting some songs like his earlier work. Dudesblood is kind of the best and worst of both worlds. Each individual song is actually great. There's a few fast catchy punk rock songs like "Dudesblood" "Smash The Tesco" and "Love Is Suicide." There's also instances when Dan slows things down like on "Pass This On," "Marfa Lights" and "You Gotta Get Mad To Get Things Done." While every one of these songs are outstanding as stand alone tracks, the album as a whole suffers a bit as it doesn't really have a cohesive direction and jumps all over the map style-wise. It's not bad and in the grand scheme of things it's not really that big a deal, but it is a bit jarring the first few times you listen to the record. 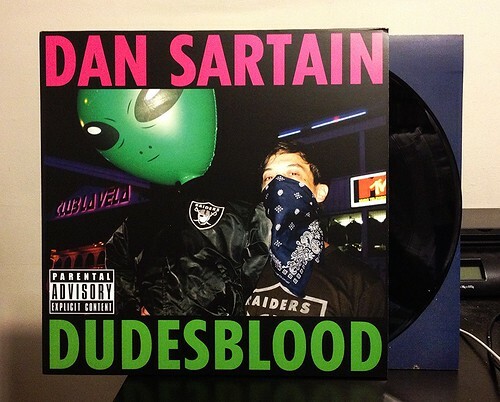 I enjoy pretty much every Dan Sartain song released into the world. I like his slow acoustic based records. I like his loud punk rock records. He's one of those songwriters that I really trust, always knowing that whatever direction he's taking his music in; there's a pretty good chance I'm going to love it no matter what.